Apparently it is not only Mikey who wants to hide the truth from the public. A three-year study by the University of Cincinnati in Carroll and surrounding counties determined hydraulic fracturing, or fracking, has no effect on groundwater in the Utica shale region, is not being released to the public. Dr. Amy Townsend-Small, the lead researcher for the University of Cincinnati Department of Geology, released the results during the Feb. 4 meeting of the Carroll County Concerned Citizens in Carrollton. A three-year study by the University of Cincinnati in Carroll and surrounding counties determined hydraulic fracturing of oil and gas wells like the Rex Energy well shown above, does not contaminate ground water. The study aimed to measure methane and its sources in groundwater before, during and after the onset of fracking. The study corresponded with an increase in active gas wells in Carroll County from three in late 2011 to 354 in 2015. Wells in three counties listed above as well as Stark and Columbiana were tested. Groundwater from 27 private water wells, ranging from 35 to 115 meters in depth three to four times a year over a two-year period from November 2012 to February 2015. A regional field campaign was also conducted in May 2014 in which 95 groundwater wells were sampled within the five counties. One hundred fifteen samples were collected from drinking water wells and two from springs. Participation in the study was voluntary. A thesis paper submitted by Elizabeth Claire Botner (who participated in the study) as part of the requirements for her master’s degree in science, noted a majority of the study took place in Carroll County primarily for two reasons: 1.) a lack of water quality data exists in the region due and 2.) Carroll County has the greatest number of hydraulic fracturing permits in Ohio. At the onset of the study, 161 wells were permitted in the county and by the time the study concluded in May 2015, over 400 wells were permitted. Through testing, it was determined that in three of the four sites with elevated levels the source of methane is liked coalbed gas. The other is site is consistent with anaerobic respiration of soil organic carbon. 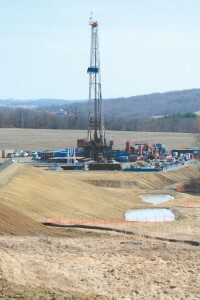 “While past studies have found evidence for Marcellus Shale-derived natural gas contamination in Pennsylvania drinking water wells due to improper well construction and maintenance, shale gas development firms may be using safer well construction practices in the relatively newer drilling area of the Utica Shale to avoid leakage from the well casings,” she wrote. She noted, as did Townsend-Small, that continual monitoring of groundwater quality, methane concentration and sources is needed to assess the longer-term impacts of hydraulic fracturing. There was a time when when universities were bastions of free thought and speech. Sadly something has gone badly wrong. Perhaps Mr Rice might like to comment? You can imagine the stink that would be kicked up if Exxon were found to be suppressing a report that they’d commissioned. Usually funded reports get the result their funders are looking for, so I suppose full marks for the researchers integrity ! I can remember when universities only made press releases when something good happened with one of their sports teams. Given that the results were presented and are on video — what’s the issue? “Dr. Amy Townsend-Small, the lead researcher for the University of Cincinnati Department of Geology, released the results during the Feb. 4 meeting of the Carroll County Concerned Citizens in Carrollton. In the world of progressive science, where contemporary funding is so often predicated on a grant application that resembles the conclusion of the study, there are no surprises here, save the obvious commendation, that not all people may be bought all of the time, even when harangued by faux-noble cause corruption. Wrong answer = not wanted. The truth can go hang. Side topic Bill McKibben is so anti-fracking he claims that recent research suggests that leaking methane is offsetting the reductions in carbon dioxide emissions. We need a list (pictures, poster; whatever) of folks such as Weepy Bill McKibben, Silly Sciency Nye, Al ‘the bore’ Gore, … many more … Peter ‘the crook’ Gleick. I thought someone had started such a photo gallery, but cannot find it just now. Why is the reality of fracking been undermined by left wing activists. Surely they want poor people to be able to afford heating and a growing economy. Or do they follow that Communist reality of keeping people poor so they will fear their leaders? They do not. They want about 6.5 Billion people to be removed from … and so on. Only true greens are allowed to remain. “Dr. Amy Townsend-Small, an assistant professor …”: poor Amy, there will be no tenure for her. Unless, being a woman, she’s pretty much guaranteed to get tenure. Hm. Maybe that’s the great hope for sceptics: encourage women and racial minority people to look at environmental scams. I think she will do fine. She is well trained, writes, and speaks well. Her page mentions the study. We are seeing not only the death of scientific inquiry, but academia. Integrity is the worst nightmare of the left and they will go to any length to stamp it out. We who oppose fracking don’t care about the “Utica Shale Regions”. But unless your are a total moron, you know that the ground and the subsurface is not the same in the Western USA where the formerly large numbers of dinosaurs lived and have left bigger deposits. The problem there (in the Dakotas, Wyoming and down though Nebraska all the way to Texas) is that the deeper subsurface contains the Ogalala Aquifer. This provides the ground water for both drinking and farming. A leak there will kill of the bread basket of wheat, cattle and other food crops. It was pollute the wells of water that farmers and ranchers need.